11 November 2008, at 9:19a.m. UK - The only UK turkey with a cherished EU food label is given a new image as the Traditional Farmfresh Turkey Association launches its Christmas promotional material. 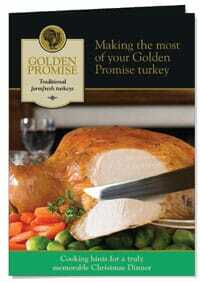 The Golden Promise brand which more than 50 of its members market around the country will be promoted in a range of posters, recipe leaflets, turkey boxes and other material featuring the new logo and key points of difference. With the wide choice of turkeys at Christmas, we need to make sure butchers and consumers are aware of what differentiates Golden Promise from other turkeys,” says Mick Binder, the Suffolk producer elected TFTA chairman earlier this year. “The key difference comes from the enhanced flavour and eating quality you only get from turkeys that are dry plucked which allows us to hang and mature the birds for seven days or more. You certainly won’t get this from mass produced birds. The posters spell out ‘What makes Golden Promise turkeys so special’. The stylish new boxes provide information around the frieze describing the points of difference. The recipe leaflets, using images from new photography commissioned during the year, provide fresh cooking advice and ideas that will help consumers make the best of the product’s traditional virtues. The new brand identity gives greater prominence to the EU designation of Traditional Specialist Guaranteed. New European Council regulations will soon require the TSG logo or relevant working to be used on all products with the designation. The Traditional Farmfresh Turkey became the first in the UK to gain a TSG label in 2000 and it remains the only turkey to enjoy this status. Currently other acclaimed *traditional British foods such as Bramley apple pie filling, Gloucester Old Spots Pork and Red Poll beef are applying for similar status. “As an association, we have invested a considerable amount of time and money in gaining the TSG acclaim and in maintaining these standards,” says Mr Binder.